The accident happened around 7:30 p.m. Friday in the area of 325 Bennett Highway, along Route 1 south. Massachusetts State Police say a pedestrian has died after being struck by two vehicles in Malden. The accident happened around 7:20 p.m. Friday in the area of 325 Bennett Highway, along Route 1 south. 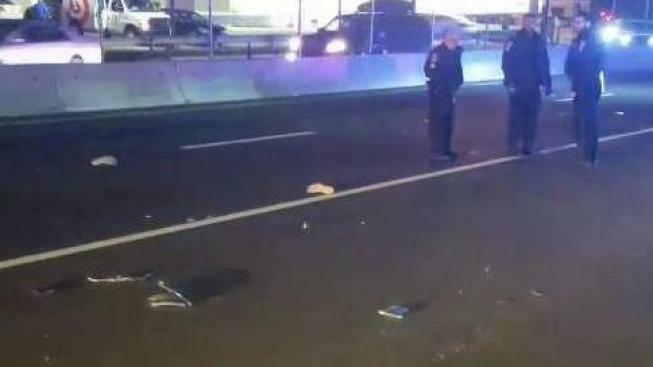 Authorities say a preliminary investigation shows a man, identified as Leith Antonio Latiker, 49, who is believed to be homeless, was struck as he was walking in the roadway on Route 1 Southbound by a 2001 Mercury Marquis, which was being driven by an 84-year-old Stoneham man. Latiker was then struck a second time by a 2012 Ford Escape, which was being driven by a 20-year-old Stoneham woman. Latiker was pronounced dead at the scene. No one in either vehicle was injured in the crash. All southbound lanes were closed following the accident, and traffic was diverted onto Route 99 just prior to the crash scene. The cause of the crash, including why Latiker was in the roadway, is under investigation. State police were assisted on scene by Malden Fire and EMS, and by police from Malden, Melrose and Saugus.